I’ve mentioned a few times that I’m a huge fan of American Chopper. I thought the show was better while it was still on Discovery Channel but it’s still a decent show on TLC. We’re missing out on some of the fun and games around the OCC shop but the star of the show is still the same. It’s still a show about the bikes that OCC builds. Over the 11 years that OCC has been around, the Teutels and company have pumped out some amazing bikes. So here’s my Top 10 Best OCC bikes. Also called the Future Bike (so as not to upset the lawyers), this bike was designed for the premiere of the Will Smith movie of the same name. Smith himself was also consulted in the design of the bike. What resulted was the bike world’s equivalent to those crazy concept cars you see at international car shows. The biggest difference is that this thing can actually run. It’s probably not the best bike to take out on the back roads but as a design experiment, I think it’s a good look at what choppers will eventually start to resemble. I’m actually shocked that this bike is this low on my list. 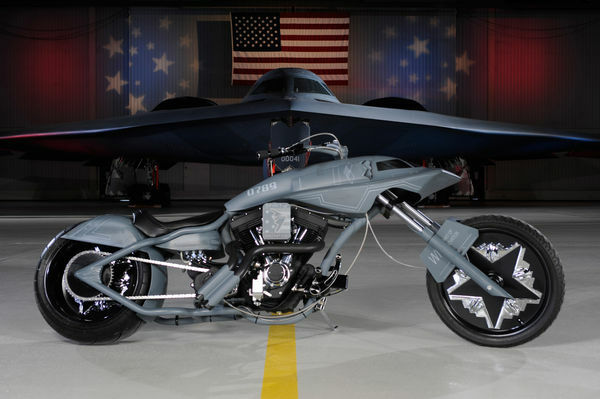 The bike was commissioned by Northrop Grumman (the lead contractor for B-2s) and the US Air Force to celebrate the 20th anniversary of the B-2’s first flight. The most obvious design feature is the gas tank which was built around the handle bars to look like the cockpit of the B-2. The wheels have five aluminum B-2 models mounted to form a star in the middle on each side for a total of 20 B-2 models representing each of the B-2s in the Air Force fleet. 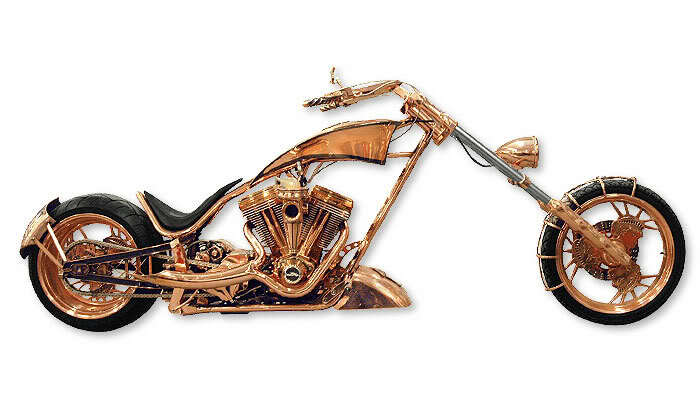 The first thing that jumps out at you about the bike is the copper that covers the whole of the bike. It turns out that whole bike is plated in copper that actually came from the Statue of Liberty. The company working on the statue’s restoration provided the copper and some artifacts to be incorporated into the bike. The wheel spokes are something special too. It’s hard to tell from this picture but the wheels feature three Statue of Liberty heads as spokes. Baseball’s Evil Empire even invades this list about choppers. 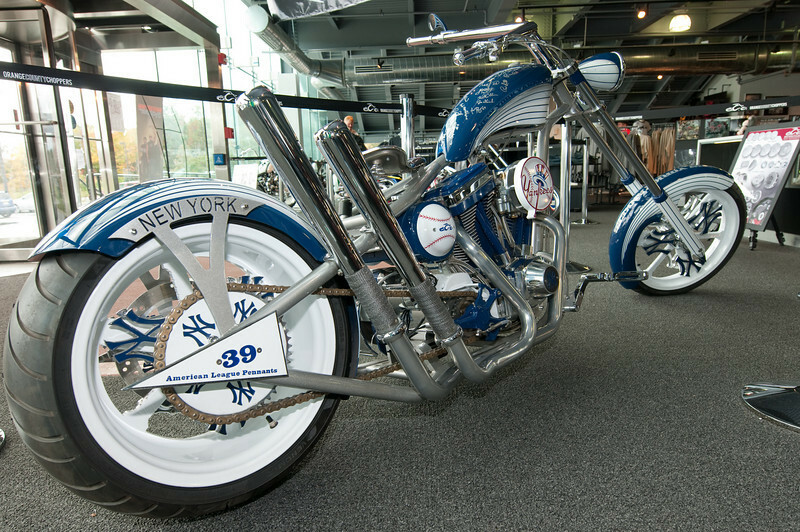 This bike was commissioned by the Yankees and the Jorge Posada Foundation for a charity auction. Even if you hate the Yankees, you’d have a hard time hating this bike. An expertly fabricated baseball and Yankees logo are on the engine and the Yankees “NY” logo is inset into the front and rear wheels. And, naturally, the trademark pinstripes feature prominently in the paint scheme. For a while there, Paul Sr. was a compensated endorser of HP computers. 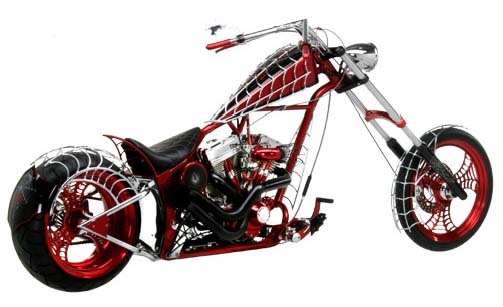 I’m guessing that it tied in with this bike build and outfitting the OCC shop with all new HP computers. If you look carefully at the top of the gas tank, you can see a little rectangle sticking out which is an HP GPS device. The great promotional tie in comes in the form of the use of HP’s trademark swirl designs on their personal computers. The paint scheme does seem reminiscent of what I have on my HP laptop. 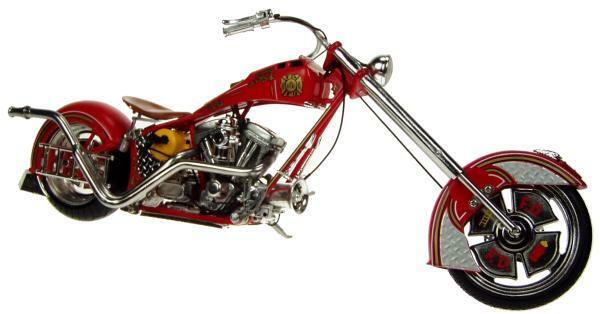 The OCC boys once took a trip down to Australia to do research on an Aussie-themed chopper. It’s been a few years since I’ve seen the episode but I believe it was for an Australian charity auction. Even though the official national colours are green and gold, the maroon and gold colour scheme works well. But there are little touches of Aussie-ness in there such as the painting of the Great Barrier Reef, the silhouette of a kangaroo in the Outback and the Australian flag. I think this is one of the most underrated bikes that the boys have built. The Intel bike is fun simply for all the bits and pieces that you can’t see in the side profile. 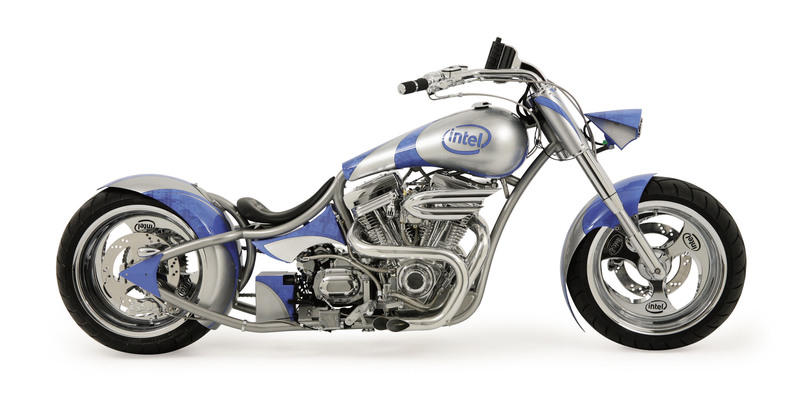 Intel commissioned the bike to celebrate the introduction of their quad-core processors so the OCC gang gave it a four-cylinder engine. The heart of the bike is a small mobile PC mounted in the gas tank with a fingerprint recognition starter, a digital dashboard, cameras instead of rear-view mirrors, a GPS system and wireless (maybe 3G) internet connectivity. 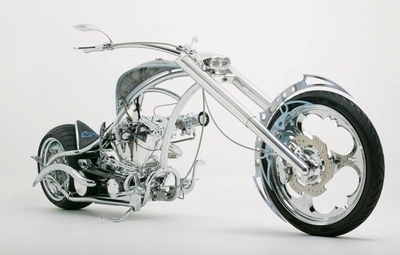 This was easily the most technologically advanced bike that OCC produced. I’m definitely going to catch some grief for not putting the Black Widow on top. 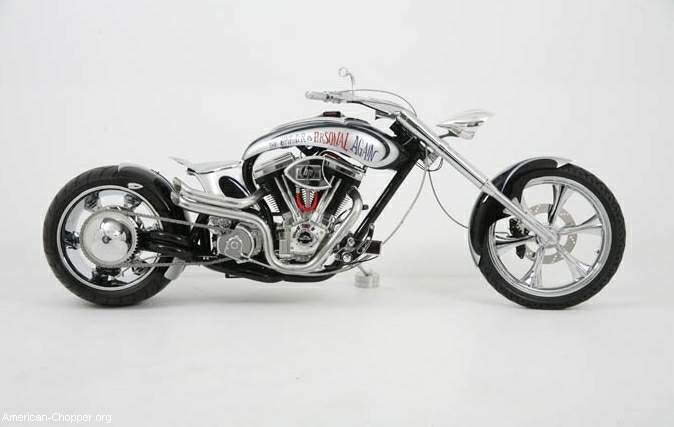 If OCC and Paulie had a signature bike that launched them to superstardom, you’d have to say it’s this one. The intricate cutting and welding work on the web work in the wheels, over the tank and acting as fenders really sets this thing apart. On tonight’s episode, Paul Jr. is supposed to be starting on his new “Anti-Venom” project which is supposed to blow this thing out of the water. I don’t think that’s possible. While this is a good bike, I don’t think it’s the best OCC has ever produced. The Fire Bike is a special project bike that was built to honour members of the New York Fire Department killed during the attack on the World Trade Center on 9/11. It’s design evokes a fire truck from the truck cab shaped gas tank, ladder suspension covers, fire hose shaped exhaust pipes and diamond plate accents. The gas tank also has a piece of metal recovered from the World Trade Center inset in it. As far as tributes go, you’d be hard pressed to find one that’s as good looking… Or as fast. Even I have to admit that putting what is more of a board-track racer as the top bike that OCC has produced is an odd choice for a chopper manufacturer. However, I’ve always liked different. 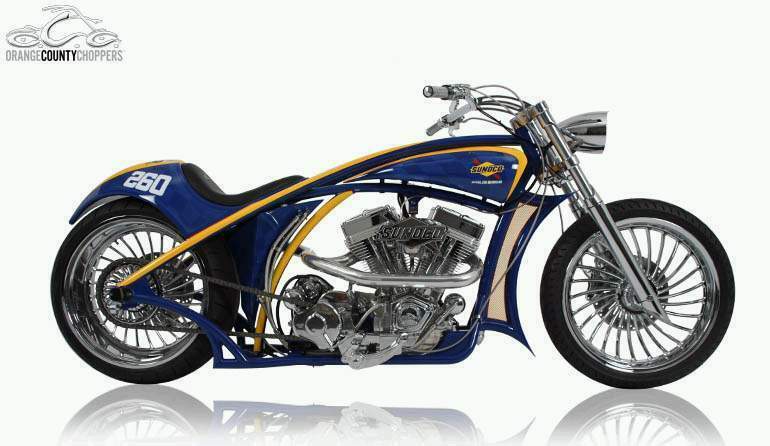 While every OCC bike is different from the last, they’ve never really come close to reproducing something like the Sunoco bike. The colours and flowing lines of this bike make it one of the best looking that OCC has produced. those are the most impressive choppers I’ve seen. I believe that the work put in to these bikes was great and has alot of hard work. Great article, Just passed this on to a coworker who read up on this and she took me to dinner after I showed her this site. So, Thanks!! Strange this post is totaly irrelevant towards the search query I entered in google however it was on the first page. Man, I truly loved reading your blogpost. 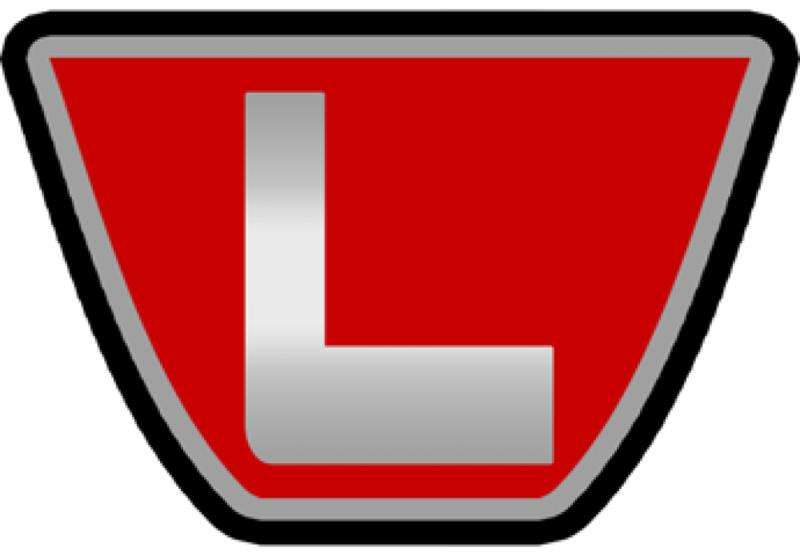 You have convinced me to subscribe for your blog, but how can i discover the Feed? what a nice bike build ever! I have to agree with you putting the Sunoco bike 1st. 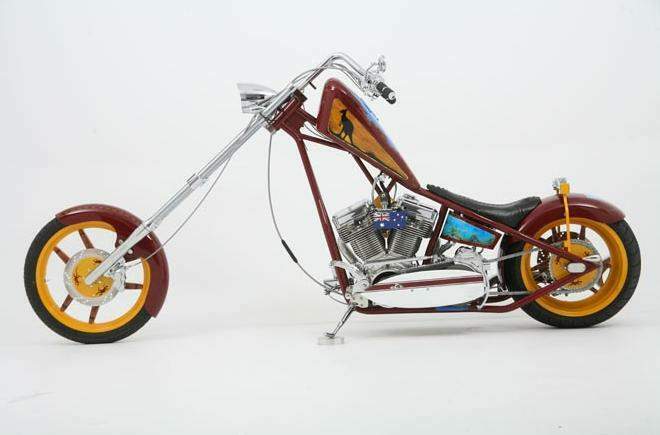 It truly is an awesome chopper. The bikes are cool! Time to re event. Tired, tired, tired. Same frame, same design, when cut to the bone. Drag bars, stretched, same show over and over. Do something different, get the old man involved! Classic, custom, open your up your minds, past meets future. I disagree they have done a great job changing things up, no 2 bikes look the same and they are all amazing bikes! I think the review is wrong! The black widow bike is my favorite by far! Excellent web site. Plenty of helpful information here. I am sending it to some buddies ans also sharing in delicious. And of course, thanks for your effort! Great post! Keep me updated with your progress! Its such as you learn my thoughts! You seem to understand a lot about this, such as you wrote the ebook in it or something. I believe that you simply could do with some percent to pressure the message house a little bit, however instead of that, that is great blog. A fantastic read. I’ll certainly be back. A fantastic read you can believe it what happend.